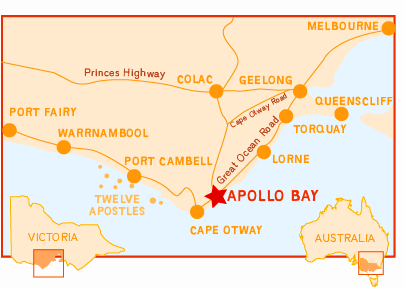 Apollo Bay is a delightful town on the world famous Great Ocean Road. The town is situated on a long sandy beach surrounded by a backdrop of rolling green hills. A working fishing harbour completes this idyllic setting. The area is abundant with activities such as; surfing, including lessons and board hire if required, kayaking to the seal colony on Hayley reef, fishing charter trips and also the harbour rock wall provides a fabulous setting to throw in a line. The town boasts a very scenic 9 hole golf course with the harbour and ocean as the backdrop. Taking a mountain bike trek through the bush is a great way to appreciate the Otways, all gear is available for hire. The Otway Giant Odyssey ride is held here. The town has a great selection of restaurants and charming cafes offering many food types, two grocery stores and a couple of pubs to enjoy a beer with the locals. A few kilometres out of town the Otway National Park has rainforest walks, waterfalls, glow worms and a koala colony in the forests near the Cape Otway Lightstation.